We leave the desert sanctuary of Marqadah at about 2 p.m. on Friday, March 24, after saying farewell to the villager who looks after the shrine of the Armenian Martyrs. 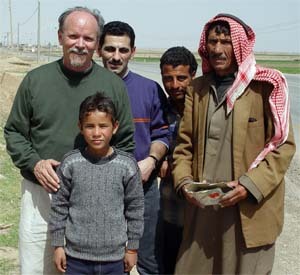 Pictured here with two of his sons (in addition to myself and Simon from Der ez-Zur) the caretaker of the shrine is seen holding a box for the bone fragments we have collected from the desert floor. Fr. Khoren will take most of these back to Aleppo, and I will carry a small portion back to the Cathedral of the Holy Trinity in Quebec City. We then begin the 3 hour journey to the famous archaeological site of Palmyra (Tadmor, in Arabic), in the general direction of Damascus. The Syrian desert becomes particularly flat and barren along our route, and the outside thermometer — a feature of the Dodge Ram we are traveling in — indicates that the temperature has reached 37C (98.6F). I'm told that temperatures in the high forties (113-118F) are normal here in the summer. The company is good and the travel easy, and it doesn't seem too long before we begin seeing the signs of the famous oasis city of Palmyra and the ruins of this once vibrant centre of desert civilisation. The "most complete and single most impressive" site among the ruins is the Temple to the god Bel — the Jupiter of the Palmyrene pantheon. 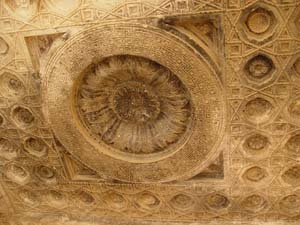 The colonnade (pictured top) lined the outer court of the temple, and the carved solid stone panel (above, left) decorated the ceiling over the temple's idol. Here (above, right) Fr. Khoren and I stand before the entrance way to the sanctuary of the temple, this large stone structure with solid walls housing the inner sanctum is readily comparable to other temples of the region including the great temple of Jerusalem. Beyond the walls of the temple stands the signature archway entrance to the main street of ancient Palmyra — this archway is well known and is featured on Syrian 500 pound bank notes. 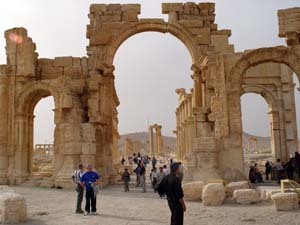 The archway is also the arrival point for the many tourists and visitors drawn to Palmyra's residue of majesty. Locals hawk postcards and nomadic headscarves here, and camel and donkey rides are offered for the enjoyment of the visitors. The children selling postcards can be pretty insistent, but they seem quite well mannered compared to the youngsters I remember selling postcards in Bethlehem! A couple of tourist buses are parked near the archway when we arrive, with small groups of European passengers exploring the ruins. 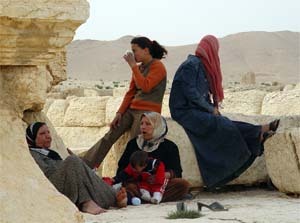 Joining the foreign visitors for a relaxing day among the ruins are many from the local community enjoying the Moslem Sabbath. Off to the west of the ruins, the 17th century fortress of Qala'at ibn Maan stands, perched on a hilltop overlooking ruins of Palmyra. The fortress is said to have been built by the Lebanese warlord Fakhr ad-Din al-Maan in his challenge to the Ottomans for control of the Syrian desert. It is not the first fortress to occupy this strategic vantage point, and the site is said to be most appreciated for the magnificent views it offers of the ruins of Palmyra, particularly at sunset. 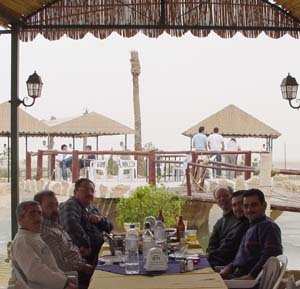 Following our visit of the ruins, Harout Vartanian invites us to a nearby desert restaurant to sample the local cuisine. It has been remarkably generous of this group of churchmen to give up their weekly day off to entertain a stranger in their midst. 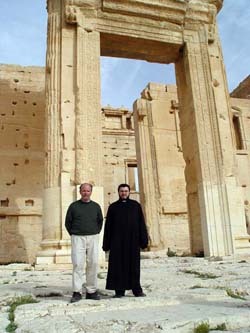 I am somewhat encouraged to learn that this is a first visit to Palmyra for Fr. Khoren and a couple of the members of the church's executive committee — doesn't it often take a visitor to help us discover the beauty of our homeland! 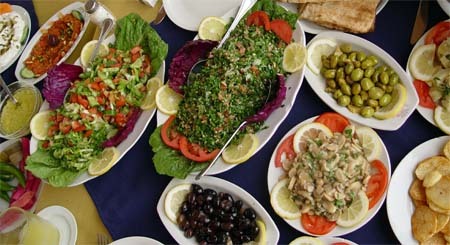 The mezze is wonderful, as always, and I certainly must conclude that Syrian cooking compares well with legendary excellence of the food in Lebanon. 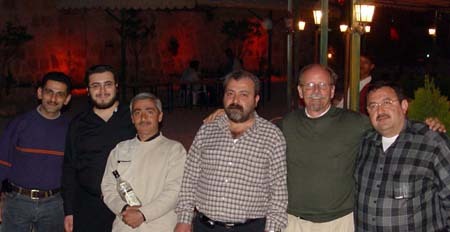 Arak is served of course (Hagop carries away the leftovers) but I opt instead to sample a bottle of the local beer, Barada, a Syrian beer bottled in Damascus which, after a day in the desert, tastes very good ineed! After a day full of emotion (Marqadah) and of wonder (Palmyra), we climb into the Dodge Ram for the two hour ride back to Der ez-Zur bidding farewell to the Syrian desert and the treasures it holds, both the tragic and the remarkable.